Provide comfort for the family of Marlene Lendvay with a meaningful gesture of sympathy. Peacefully at the Woodstock Hospital on Saturday December 1, 2018. Marlene (nee May), of New Durham, in her 80th year. 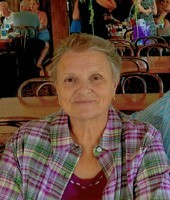 Beloved wife of the late John Lendvay (2008). Loving mother of David (Marlene), Diane (David) Schertzberg, and Darlene (Glenn) Aicken. Cherished grandmother of Alexis and Zoe Lendvay, Melissa (James) Gow, Ryan (Nicole) Schertzberg, Vanessa (Clayton) Shebec, and Gina and Carla Aicken. Great-grandmother of Lennix Schertzberg, Griffyn and Myra Gow. Dear sister of Gord and Paul (Elly) May. Sister-in-law of Durk Ypma, Tom Porchak, Frank (Carolyn) Lendvay, Julie (Medard) Herreman, Joe (Barb) Lendvay, and Phyllis Lendvay. Predeceased by her sister Carole Ypma, sisters-in-law Sharon May, Mary Porchak, Phyllis Lendvay and brother-in-law Steve Lendvay. Marlene will be sadly missed by many nieces, nephews, family and friends. Born in St. Thomas, Marlene moved to New Durham after marrying her best friend John. Her greatest joy was her family but she found beauty in all living things. Marlene was a true farmer from her green thumb to her Brown Swiss cows. Always willing and able to help, she could bake chiffon cakes to driving tractors in the field. Everyone knew her red truck and endless stories of everyday life. Jim and I send out heartfelt condolences at this very sad time for you Darlene, Glenn, Carla, and Gina . In loving memory of Marlene, who dearly loved her family, friends and animals. So sorry for your loss. Our thoughts and prayers are with you. HUGS!